Best Cappuccino Maker – So, you love coffee and you want to make it at home, right? Then this article on the Best Cappuccino Maker will definitely come in handy. There’s an overwhelming amount of information and instructions on purchasing coffee machines including guides by all the so-called coffee ‘experts’ out there, and by the time you’ve exhausted all the names, model specifications, fancy features and prices; it’s a wonder how anyone can decide. That’s why we’ve made it simple and easy. From a #1 Best Seller, to the elite of coffee-brewing technology as well as the very basics; we’ve highlighted a few key features and a short description to help you narrow down your options and decide which cappuccino maker would best suit your home, so you can get started enjoying the coffee you love! 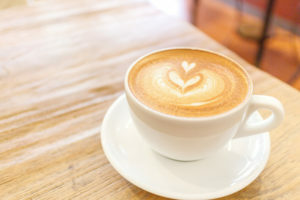 As the name suggests it’s a machine used to make a cappuccino – a drink, which is made from a shot of espresso-style brewed coffee with steamed frothy milk on top. You’ll quite often see cappuccinos with chocolate sprinkled on top to give it a sweeter taste too. 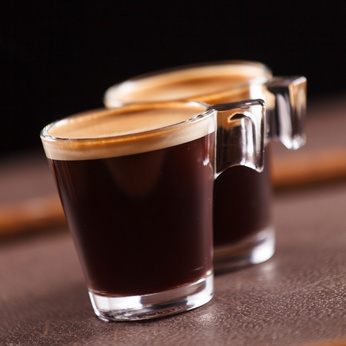 Espresso actually means fast and in fact, the cappuccino maker was originally invented in Italy, when somebody decided to use pressure in the coffee-making process in order to make it quicker. Coffee is added to the cappuccino machine and then water is forced through under-pressure, which causes the flavour to be removed from the beans. It’s FAST – the most-desirable quality of these types of coffee machines is their speed and efficiency. Your morning coffee is the last thing you need to worry about first thing in the morning – or at any point in the day for that matter. It’s personalized – the best thing about having your own machine is you can make your own coffee how you like it! And nowadays many machines come with instructions and even recipe books on how you can experiment with new flavours and brew your favourite drink. It’s fun – everything from waking up to that fresh coffee aroma to that first sip is so much more fun with your own machine and with so many settings available to adjust timings to fit you schedule and personalized options, brewing your own coffee really doesn’t have to be something you just endure. This DeLonghi system literally has it all – priding itself in all the features you could ask for including self-cleaning functions for easy maintenance; a fully stocked welcome kit, which contains Nespresso coffee capsules for use with its patented coffee capsule system and a wide range of features for fast and easy lattes, cappuccinos, hot milk etc; all at the push of a button. One unique function that is particularly impressive is that you can personalize and save your favourite drinks. You can adjust the milk or coffee – with a separate milk tank, which is easily slid into the front of the machine and all controlled by illuminated keys to help you access the selection available…as well as adding to the cool factor! → Get the DeLonghi Silver Lattissima Plus on Amazon! Ever felt like the prices of coffee machines should mean they do everything including the washing up? Well, with the Mr. Coffee Café Barista Premium Espresso Maker, that’s pretty much what you’ve got. At the touch of a button – simply labeled and preprogrammed, this machine goes to work for you! And in case you get bored…you can try out the manual espresso and milk froth modes, so you can customize your drink exactly how you like it or try out something new and creative with a coffee recipe book included. So, no more excuses, time to be your own barista! → Get the Mr. Coffee Café Barista Premium on Amazon! Easily summarized as everything you’d expect from a DeLonghi product, with features that seem far too technical for a simple coffee machine. With the unique patented dual filter holder, you can use ground espresso or E.S.E (easy serving espresso) pods. Zero wasted start-up time with the self-priming operation and with two separate thermostats controlling water and steam pressure, your drinks will be made at a guaranteed the perfect temperature. And the cleaning? Couldn’t be simpler, DeLonghi has made disassembling, cleaning and reassembling this espresso and cappuccino machine as straight-forward as possible with removable drip tray and water tank. And all at such a reasonable price – no wonder it’s a #1 Best Seller. 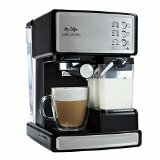 → Get the De’Longhi EC155 on Amazon! It doesn’t come much simpler than this! A small, basic machine with a durable stainless-steel lined heating system – it hasn’t got any of the frills but according to reviews, it serves its purpose well…and at a great price. Possibly a little fiddily, but includes all the features you’d want from a quality espresso and cappuccino machine. In summary, a great purchase for buyers not looking to fuss. 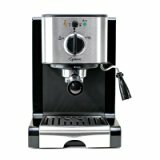 → Get the Capresso EC100 Pump Espresso and Cappuccino Machine on Amazon! Warning – don’t proceed flippantly! This machine promises to bring out the big guns at a high price – but a high quality to match. With technology you didn’t even realize existed, this machine strives for the best quality product you could ask for. It really is a case of what can’t you customize and adapt to preference with this Philips Saeco machine: including the strength of flavor, the exact amount of coffee beans and how much coffee you’d like to brew as well as the temperature of course; even how long you want your coffee to be moistened in the infusion chamber before brewing. This coffee machine even automatically cleans the coffee circuit whenever it goes into or comes out of standby mode. Thoroughly tested and guaranteed – but at that price, I’d expect nothing less. → Get the Philips Saeco Royal One Touch on Amazon!